American Authors released its third album, “Seasons,” last Friday. Not much was known about the album ahead of release, and the lead singles “Deep Water” and “Neighborhood” were fairly different from each other and the sort of music they usually make. Their 2016 album, “What We Live For,” was a major success critically and commercially, with songs being used in video games, the NBA and the 2016 World Cup of Hockey. This newest album had a lot to live up to, but does it? There is really no short answer to that question, as the album feels like a mish-mash of styles. That is not to say that this is a bad thing, but the album feels almost like 2 distinctly different albums as opposed to one cohesive collection. This could be due to the track order or just a general darker tone than previous American Authors albums. “Seasons” seems to break up nicely into two sections, with the first half and the second half feeling very different from each other. The opening song, “Stay Around,” feels a little more pop-y and different from the rest of the album. It feels repetitive and manufactured in a way that is unlike the rest of the band’s catalog. All of the first four songs feel very upbeat, with the third track, “Calm Me Down,” even having an almost hip-hop vibe. The fifth song, “Neighborhood,” prompts the mood shift and is the first time that the album’s pace really slows. This song feels most like previous music from American Authors. However, it also marks a turn in the album, where the following tracks have a more emotional, visceral feeling. The song “Deep Water” feels like it comes from a very emotional place — no doubt due to vocalist Zac Barnett’s intertwining of his emotions into his unique singing voice. The song “Real Place” ends the album, and it is also a very powerful song, ending the second set of five songs in the same introspective, slow-paced way that “Neighborhood” ended first set of five. 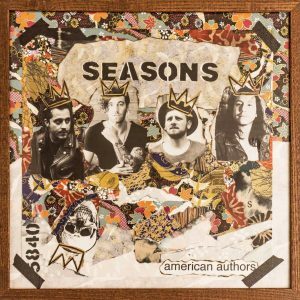 It is hard to recommend “Seasons” as a must-listen for American Authors fans. The album is definitely darker than previous albums, and, on the whole, the songs are also much more emotional than previous singles. There are some songs that fans will love: “I Wanna Go Out” is stylistically similar to the bangers that gained the band their popularity; “Neighborhood,” while sentimental, is still a great song; and “Can’t Stop Me Now” will likely be the standout from this album. With the stylistic differences from their previous work and even within the album, the album as whole is a hard one to recommend. Treat it like a buffet: take the stuff you want, skip the rest.